Four British nationals have died and 12 others have been injured in a coach crash in Saudi Arabia, a travel company has said. The victims were on a pilgrimage on Saturday when their coach was hit by a fuel tanker, according to Hashim Travel. The truck then caught fire, setting the bus alight, it said. A woman aged in her 60s from Blackburn, Lancashire, an elderly woman and her adult son, from Preston, Lancashire, and an elderly man, also from Preston, died in the crash near the town of Al Khalas, said Blackburn-based travel firm Hashim Travel. The driver of the petrol tanker is also said to have died, while other coach passengers were treated for fractures. A young child is believed to be among those injured. The coach had 18 people on board and was travelling from Mecca to Medina when the collision took place near the town of Al Khalas, around 30 miles north of Mecca. A spokesman for the Foreign Office said the department was supporting the families of the victims. Family members of the victims are planning to fly out to Saudi Arabia within the next 24 hours. Passengers on the bus were from Birmingham, Accrington, Wolverhampton and Northampton, as well as Blackburn and Preston. The passengers on the coach were on an Umrah pilgrimage, a smaller Islamic journey than the annual Hajj pilgrimage. 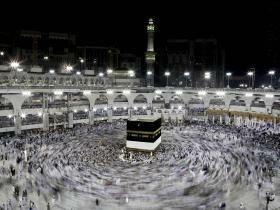 Hashim Travel says it has been operating specialist Hajj and Umra tour packages for more than 15 years. Unlike Hajj, there is no fixed time of year when Muslims have to perform Umrah and it is not considered compulsory. Some Muslims refer to it as the “lesser” or “minor” pilgrimage. In Arabic, Umrah means to visit a populated place.